...prompts us to take a broader perspective and not focus on the vine alone, but rather on everything which surrounds and interacts with it. This gives rise to the concept of biodiversity, directly linked to the wide range of natural environments, such as grassland and the edges of the vineyard which are mown late. Woodland, natural or planted hedges, and wetland areas are preserved. The resulting patchwork has a very positive impact on the landscape, of which we are the guardians. The estate also serves as a refuge for wild animals, so hunting is banned on its land. .
W hen we talk about biodiversity, the first things that come to mind are the animals and plants which we see, but there is also another invisible (or virtually invisible) component in the form of the soil’s microfauna and microflora. Sparing use of copper (less than 3kg per hectare per year), a metal which is particularly helpful in combatting downy mildew, will not harm fungi and bacteria. The humus – a veritable pantry for the plant – will be able to regenerate. Surface tillage will help to aerate the soil without breaking down its structure. 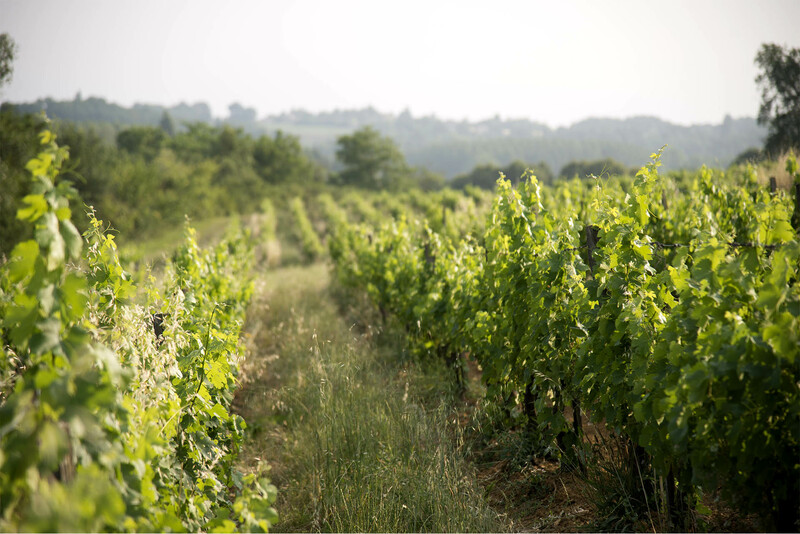 Biodynamic practices became a necessity when we acquired Château La Grolet, allowing us to help and support nature in order to ensure that our vines give the very best of themselves and produce rich, concentrated grapes. With grapes this good, no inputs are required in the winemaking process, with the exception of sulphur – which is only used in small quantities to avoid ‘muzzling’ the wine. Guillaume therefore demonstrates great empathy, attention and sensitivity in his work, standing virtually as an artist who enhances the grapes. A wine made without any trickery, for which any technology designed to modify its original structure is banned but which allows us to be more precise and respect the wine, is therefore a welcome prospect. For example, self-regulated temperatures allow us to guide our yeast during the fermentation process, and the use of inert gases and a state-of-the-art press enables us to protect our must from oxygenation and thus reduce sulphite use. In 2014, our quest for purity prompted us to try using amphorae, or more precisely wine jars made from terracotta. What nobler material could there be to mature a wine than that from which it originates, in this case clay. From a more technical perspective, terracotta is more breathable than wood, and this careful oxygenation helps to soften the tannins and allow the wine to open up. However, we also use stoneware eggs to produce a rosé, with the difference being that the baking process makes the egg airtight. Another similarly important factor is their ovoid shape, since an egg – whether round or oval – is a true concentrator of energy which helps to produce living beings, as well as wine which is also alive to a certain extent! The lack of angles and corners also ensures that the liquid is in constant motion: aromas which were previously suppressed will reveal their true colours. E ven so, we do not ignore the potential of oak, as our two Quintessence and Tête de Cuvée wines are matured in new barrels. We select barrels made from oak which has been gently toasted for a long period to avoid adding overly pronounced toasted notes to the wine, in order to respect the fruit. If a wine is put in barrels, during the first months of the maturation process the oak jettisons its tannins which eventually combine with those found in the wine. The result is that the tannins are fixed and become softer over time. The range of aromas becomes more complex. A wine therefore requires broad shoulders to be able to stand up to a barrel.